Some -- but not all -- antibiotics for dogs and routine dog medications are identical to the human versions. Here are some lists of safe human medicine for dogs to take and human antibiotics for dogs that you can safely substitute. IMPORTANT: You must know your dog's weight, and get prior approval from your vet in case your dog has a specific health issue. There is safe medicine for dogs currently in your medicine cabinet. When using people medicine for you dog you, have to make sure that you give the correct dosage based on your dog’s weight. Use this list of safe medicine for dogs. 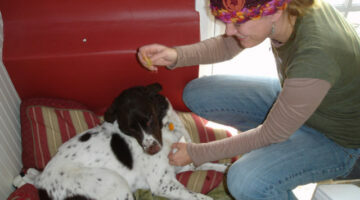 Here are 5 easy steps for giving your dog a pill. Trust me, it’s easy! In addition to listing which human medications are acceptable for pets — along with the pet-friendly dosages — this article highlights the importance of double-checking the dosage information before dispensing any medications to your pets. I mentioned the dosage for LIQUID medications in milliliters ml, whereas others sometimes mention the dosage for solid medications or pills in milligrams mg. Rarely is a difference in the effectiveness of liquid vs solid medications, there IS a huge difference in dosages if you happened to mistake mg’s milligrams for ml’s milliliters.